If I remember correctly, the Pink Panther theme was the second song I learned to play on the guitar (the first was Wipeout). It’s a great song for beginners, since it’s pretty easy, but still has several technical elements which will have you improving your guitar skills. And of course, it’s fun to play and everyone knows it, probably because of the wacky nature of the entire song. The cover you’ll learn in our Pink Panther theme guitar lesson is very authentic of the original, which of course has many instruments playing, and we just have a guitar to make do with 🙂 But we’ll get there, as I said, this is a great guitar cover. So you’ll start out by learning the F# power chord, and do a couple of power chord slides. 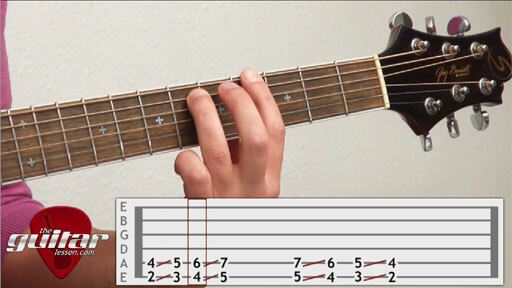 This will probably be the toughest part of the lesson for most beginner guitarists, as doing slides with the power chord being held down is tough on the fingers. You have to keep them really rigid to maintain the power chord shape, so you’ll probably want to practice that a bit. Once you’ve got the slide down, you’ll learn that so characteristic main Pink Panther theme, which will have you practicing alternate plucking, slides, hammer-ons, so you’ll be giving lead guitarist inside you a nice workout. All in all, the Pink Panther theme is pretty easy to play on guitar. Beginner guitarists will find it lots of fun, but more advanced players will enjoy the quirky nature of the song as well. The Pink Panther theme was written by Henry Mancini in 1963 for the film The Pink Panther. Henry Mancini was an American composer who won a record 20 Grammy awards throughout his career. The Pink Panther Theme was used in all 11 Pink Panther movies, as well as being featured in a number of TV shows and cover version played by various artists. You may not know that the cartoon character was created for the film, and was later made into a cartoon series. Sorry, but you've reached a premium content area. The download of the Pink Panther Theme tablature file is only available to premium members. Sorry, the same goes for the backing track. To download the backing track to Pink Panther Theme, please log in and revisit this page.